Lens Description: The Voigtlander Color-Skopar 21mm f/4.0 Pancake lens with the VM lens mount, is designed especially for use with the Bessa R4M/R4A cameras, and will work on any camera that uses the Leica M mount. With the Bessa R4M/R4A cameras that have a built-in bright frame for 21mm, the necessity to use an external viewfinder is eliminated. This ultra-compact wide-angle lens features exceptional close focusing capability, as close as 1.5\' (0.5 m). The focusing lever allows you you to go from minimum distance to infinity in less than a 90 degrees rotation. The Apertures is selected via the click-stop diaphragm. 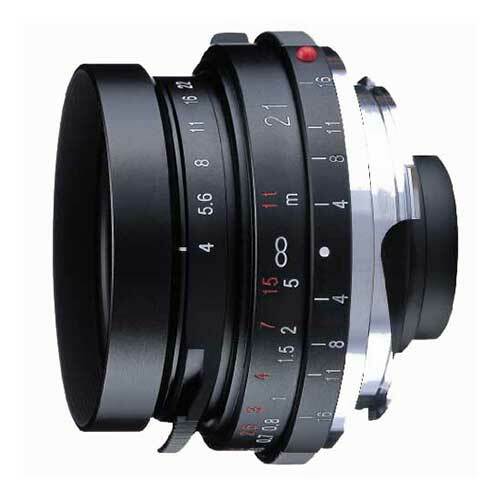 With an exellent depth of field scale, the 10 blade, circular aperture will produce smooth and natural renditions of defocused images, with nearly circular shapes of light point sources.